We’re now into triple figures for the number of days that we’ve been on the road and thus another milestone reached. With Sandy still taking things easy due to her stomach bug, we did little else other than relax on this our one hundredth day of travel. Sandy’s temperature shot up to one hundred and two last night (assuming we operated the electronic medical thermometer correctly) but she feels a lot better today and is definitely on the mend. I managed to upload three new pages of photos from our trip through Egypt and the Red Sea and sent out another World Travel update this morning. Not too sure what’s happening with the web site but the photos weren’t accessible this afternoon, although there was no problem earlier when I uploaded them. Lunch for today was at the local Burger King and was a ten-minute taxi ride to another part of town – still not too very keen on Middle-Eastern food. Whilst going through my e-mail, I noticed a message from Trudy and Anthony, the couple we met on the boat from Hurghada to Sharm. They are here in Amman and are leaving tomorrow for Kerak. Quite coincidentally, they are staying at the Palace hotel just up the road from us so I went there and left them a message to contact us this evening. Trudy called at around four o’clock and we arranged to meet up at seven to go out for a meal together. We spent the rest of the evening in their company and we all had a thoroughly good time. Much like ourselves, Trudy and Anthony never stray far without a Lonely Planet guidebook under their arm and we decided to try a restaurant that was recommended in their Jordan guidebook called Batata, where potatoes (French fries) were the specialty. The only trouble was that nobody here at the hostel knew of the place so our friendly hostel manager, whom was still as eager as ever to please Mr. Chris, wrote down the name of it in Arabic for us to hand to the taxi driver. 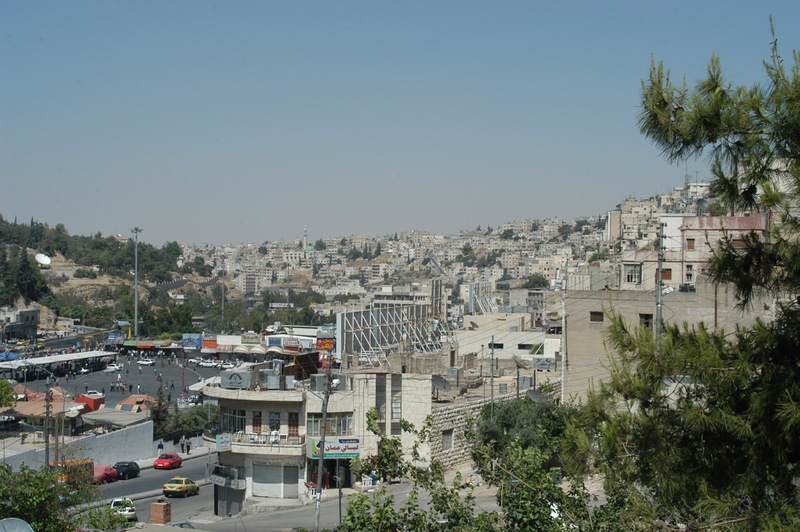 It wasn’t very far away as the crow flies but it was at a significantly higher elevation (Amman is sprawled over an extremely hilly area) and the walk would have killed us. We gave the note to the driver of the next passing empty taxi and he nodded affirmatively and we got in. Soon after we started moving, however, the driver looked at the note again and started mumbling in Arabic. None of us understood the words he was speaking but it was pretty clear that he had no idea where the place was (more fool us for thinking so based on his initial affirmative gestures) so we pointed him in the general direction to where we thought it was supposed to be, just up the hill. After about five minutes of driving and a couple of premature stops to ask for directions, we arrived at the top of one of the hills just next to the Citadel. Here we asked a group of people outside of what looked like a restaurant come coffee shop for directions. After the taxi driver and this group of people debated where this place might be, we decided to ask to see their menu whilst we waited. The restaurant manager seized this opportunity to throw us his sales pitch and we eventually decided that this place was as good as any and so got out, paid the driver and went inside. The whole situation was quite comical and none of us could contain our laughter. We had a reasonably good meal and the manager was very nice. He even gave us some brochures and maps about Jordan to take home with us. We sat initially in a nicely laid out little Bedouin lounge area for a drink of water before sitting to eat. It was rather quaint, if just a little bit tacky. The large sliding glass windows provided us with a spectacular view out over Amman. The city seemed to come alive after sunset with the many streetlights and the glow of florescent green lighting that adorns all the mosque towers here. The manager was telling us that the green light on the mosque towers is something specific to Amman. He might have meant Jordan as a whole but we’re not sure about that. Another difference between the mosques here and in Egypt is that the five times daily calling of the faithful to prayer here is the same voice and synchronous between all the mosques. It’s only the shifting wind that makes it hard to realise this sometimes. A radio broadcast is fed into the loudspeakers on the mosque towers. In Egypt, every mosque has a different voice and a different prayer calling. After our meal, the manager wanted us to dress up in Bedouin clothes and pose in the rest area for photographs. This is something that the restaurant has recently started doing with its guests so that they can put photos of their customers on the walls. We were happy to oblige and the whole thing was really quite humorous, but again a little tacky. We all had a really good laugh, however. Anthony and I drew the line at the request from the manager for us to parade in front of the other guests in costume to dance to the musician’s guitar playing. It’s difficult to believe that we would have any dignity left after dressing up the way we did. We all eventually went back to our hostel and spent the next hour or so chatting on the third floor balcony overlooking the bustling street, just passing the time and exchanging travel anecdotes in the cool city air. Given the length of the taxi ride back to the hostel, we were wondering just how far away the restaurant was. All the hills and winding turns made it difficult for us to judge our bearings in the night. Ironically, we eventually spotted the restaurant perched atop the neighbouring hill right next to the Citadel – not three hundred meters from our hostel. Either both our taxi drivers took us for a spin around town to rack up the meter, or it was just the way we had to go to physically get there. Either way, the fare was less than JD1 each way so we all saw the humour in the situation. We will miss Trudy and Anthony but we will most likely see them again in their home town of Melbourne, Australia when we reach that far by the end of the year. We’ve exchanged contact details and will definitely look them up. I really should start to keep a notebook with me during the day to write down passing thoughts that I want to include in my nightly write up. There are several things that I want to write about now but since it’s already twenty past midnight and I’m extremely tired, I will have to leave things there for now.